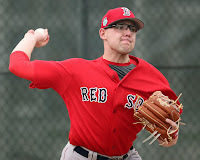 Marcus Walden was lights out for innings, racking up eight strikeouts and no walks without allowing a run. Sam Travis was 2 for 4 and is now 5 for 11 over his past three games. Deven Marrero also collected a pair of hits. The Sea Dogs let a 5-2 lead slip away as Teddy Stankiewicz was knocked around for five earned runs in six innings. It was his first start this season allowing more than two earned runs. Jamie Callahan struck out the only two hitters he faced. Rafael Devers homered as part of a 1-for-4 night and Tzu-Wei Lin also homered for the second straight night. Nick Longhi went 2 for 4. Josh Tobias followed up last night's 3-for-4 performance with another 3-for-4 game. He has his batting line up to .345/.412/.494 on the year. Josh Ockimey had a nice night as well, going 2 for 4 with his fifth double. Jose Sermo homered for the first time this year. Bobby Poyner was the lone bright spot on the pitching side, with four strikeouts and no walks in two innings. Mike Shawaryn continued to pitch very well, allowing just one hit, two walks, and no runs over six innings of work while striking out five. Stephen Nogosek picked up his seventh save by throwing 1 2/3 scoreless innings with two strikeouts. Santiago Espinal went 3 for 5, and Tyler Hill and Lorenzo Cedrola each hit doubles. Bobby Dalbec was 0 for 4 with a walk. Player of the Night: After allowing nine runs in two innings during his season debut, Mike Shawaryn has now allowed just three earned runs in 21 1/3 innings since. The 2016 fifth-round pick also completed six innings for the first time this season. He also has a very impressive 30:5 strikeout-to-walk ratio in those 21 1/3 innings since his first outing of the year.